This HME Deluxe Skinning Tool takes the hassle and headache out of skinning game. 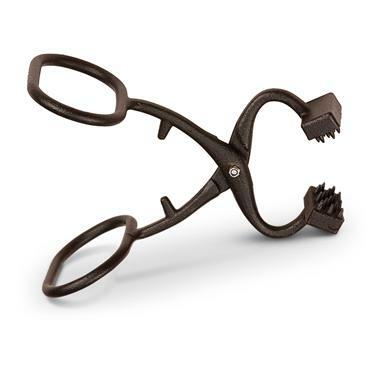 Large gripping teeth combined with a scissor-like action makes quick work of tough jobs. Plus, large, closed-loop handles allow for easy one or two-handed operation. HME Deluxe Skinning Tool is rated 4.7 out of 5 by 72. Rated 5 out of 5 by Mrarcher1991 from A must for skinning pigs! Rated 5 out of 5 by KenC from Grip it and Rip it If you have trouble holding onto the hide, this tool is what you need. It grips the hide and provides a big handle that does not need to be gripped tightly, like the hide. Works great. Rated 4 out of 5 by Bill from Time Saver A giftfor my son, I've used this item for years. Only thing my son wanted for Christmas. A must for deer hunters who process their own game. Rated 4 out of 5 by Owldreaming from Makes skinning a LOT easier! This is made nice - it won't pinch your fingers.This is the second one I have bought!I used to receive SPG items in three or four days. Now it takes much longer. - Hope they get that straightened out . Rated 5 out of 5 by bobbyg from Great item I've had one of these for years and it works great. I had to buy two more as my neighbor and brother-in-law borrowed mine, nice Christmas gifts!